The idea of the baking soda addition was not taken out of the blue but based on something I gleaned from the chemistry of the Maillard reaction. Popularly known as the “browning reaction,” the Maillard reaction is the chemical interplay between a reducing sugar (a sugar that under alkaline conditions, forms reactive ketones or aldehydes) and an amino acid (the basic building block of all proteins). As a chemist, I have always found the Maillard reaction to have a deceptive name, camouflaging the fact that a surprisingly large number of reactions occur when a reducing sugar and an amino acid are heated together. In addition to its complexity, I had noted the pH dependency of the Maillard reaction. By increasing the pH–making the food less acidic and more alkaline–the Maillard reaction can be sped up. And the addition of baking soda happens to be a convenient way of doing this. Over time, it became clear to me that the use of baking soda was only one of many ways cooks can and do influence the speed of the Maillard reaction in the kitchen. Ever since the French chemist Louis-Camille Maillard studied the metabolism of urea and kidney illnesses and published his thesis on the actions of glycerin and sugar on amino acids in 1913, the Maillard reaction has been a hot research topic. A review on browning reactions in dehydrated foods, which appeared in the first volume of Journal of Agricultural and Food Chemistry, remains the most-cited paper in that journal’s history. It is sad, yet understandable, that undesirable occurrences of the Maillard reaction have received more attention in the scientific community than the desirable ones. Fortunately, desirable Maillard products have been explored for thousands of years in the kitchen and the results are well-documented in numerous recipes. The Maillard reaction, which is also sometimes referred to as “nonenzymatic browning,” produces volatile compounds that contribute aroma and nonvolatile compounds that provide color, known as melanoidins. Some of these compounds contribute to the resulting flavor as well. The Maillard reaction imbues foods with a characteristic smell, taste, and color. High-temperature processes in particular, such as frying, roasting, grilling, and baking, rely heavily on the Maillard reaction for the characteristic aromas it produces. What would the crust of a freshly baked loaf of bread be without the Maillard reaction? What would beverages such as espresso, hot chocolate, or Irish stout be if the coffee, chocolate beans, or barley were not roasted to facilitate the Maillard reaction? Or the nice meat flavors of a beef roast? Or the smell of toasted white bread? Browned onions? The list is endless. It is possible to speed up the Maillard reaction by choosing favorable conditions. Chances are, you have done this without knowing or thinking about the chemistry. One can speed up the reaction by adding protein or a reducing sugar, increasing the temperature, using less water (or boiling off water), and increasing the pH. In fact, when looking for examples, I was surprised the extent to which conditions favoring the Maillard reaction had found their way into recipes. When I was little, I remember my mother brushing leavened yeast buns with milk or egg yolk to give them a nice brown crust in the oven. She knew nothing about the Maillard reaction, but she did know how to obtain the desired color and aroma. In the glazing of baked goods, milk or eggs provide the protein source that leads to Maillard reaction browning. In recipes in which eggs are used because of their binding and emulsifying properties, the role they play as a protein source for the Maillard reaction is sometimes overlooked. An added benefit of the egg yolks when applied to yeast buns is that the viscosity allows a thicker layer to be brushed onto the surface, yielding a glossy finish. Milk, on the other hand, provides the reducing-sugar lactose in addition to protein, which compensates for the lower viscosity with regard to browning potential. Brushing yeast buns with egg (or milk) provides the ingredients needed for a wonderful nice browning of the surface. 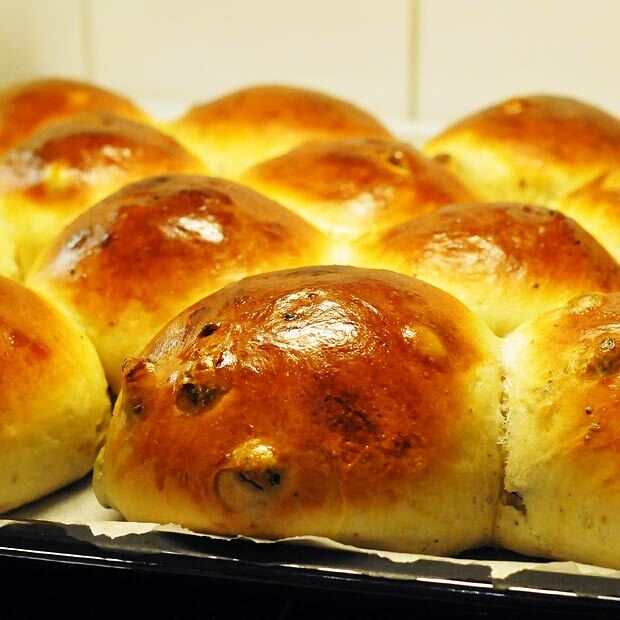 Yeast buns can also be brushed with sugar water before baking. Even though sucrose is not a reducing sugar, it easily breaks up into fructose and glucose when heated, and these take part in the Maillard reaction. When a sugar is applied to a surface that is exposed to heat, there will be a fine line between caramelization, which involves only sugars, and the formation of Maillard products. If the surface contains proteins or amino acids, both caramelization and Maillard products will be observed. This will also be the case for the yeast buns. Another example is glazed meat, such as ham, in which the sugar reacts with proteins in the meat. Barbecue marinades and sauces for basting or brushing can contain a lot of sugar. This encourages quick browning, but it can be a disadvantage if the meat is cooked at a high temperature or for a long time. With plenty of sugar present, the Maillard and caramelization reactions proceed fast but may also go too far, yielding higher concentrations of the Maillard products and an unpleasant burned flavor. When grilling with direct heat from hot coals, it is advisable to leave the sugar out of the marinade and save the sugar-rich sauces for a last minute brush. Because both a reducing sugar and protein are required for the Maillard reaction to occur, the preparations of butterscotch, caramel candy, and toffee each represent a nearly perfect setup. The making of plain caramel starts with water and sugar. The water stabilizes the temperature as it evaporates and cools the syrup. This allows the syrup to be cooked for a longer period of time without burning. In this process, rich caramel flavors develop. In the making of butterscotch, caramel candy, and toffee, butter and/or milk are added to the syrup. This provides the required proteins for the Maillard reaction to occur alongside the caramelization. 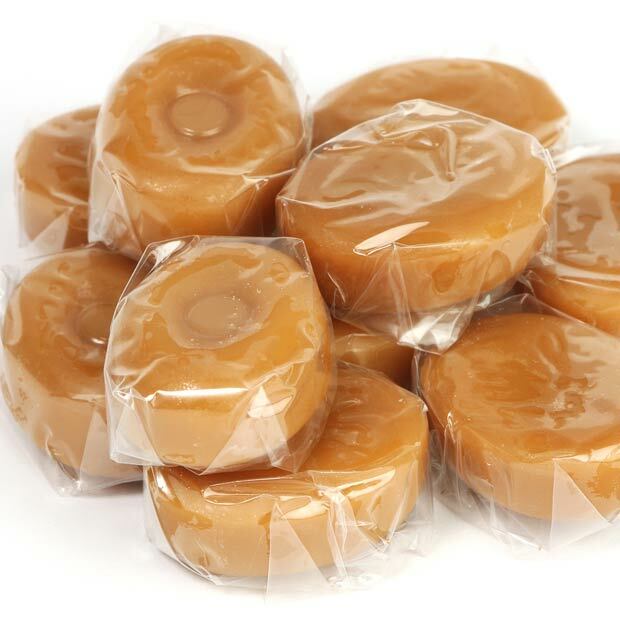 With sugar and protein present, butterscotch is an ideal setup for the Maillard reaction to occur (Photo: Butterscotch Candy from Bigstock). In several countries, including Spain, Argentina, and Singapore, it is common practice to add sugar to coffee beans in the roasting process. The resulting coffee is known as torrefacto or torrado, not to be confused with torrefied coffee, which refers to conventionally roasted coffee. Several explanations exist for why this is done, including the formation of a thin sugar film to protect the beans from oxidation as well as to compensation for weight loss from evaporation (in some countries up to 20 percent sugar is added, and sugar is cheaper than coffee!). Others claim that it is a simple way of masking the flavor of inferior beans, especially cheap robusta beans. As the sugar is heated, it caramelizes, and the sugar solution penetrates into the coffee beans, taking part in the Maillard reaction. Despite the obvious potential for less-honest coffee roasters, the torrefacto method is used with success to obtain a special aroma, and it is not uncommon to find a fraction of torrefacto beans added to conventionally roasted beans. This influences the resulting flavor, emphasizing toasty, earthy, and musty flavors. Apart from adding proteins and reducing sugars, there are other ways to influence the Maillard reaction. Temperature is crucial, and the correlation between temperature and browning is obvious. In order to obtain sufficient Maillard products within minutes or hours, a temperature of more than 212°F (100°C) is required. This is easily achieved in processes such as frying, roasting, grilling, toasting, flambéing, and baking. A typical temperature range of 230 to 340°F (110–170°C) is often cited as ideal for the Maillard reaction to proceed in the normal time frame. If the temperature gets too high, bitter flavors develop, even before the surface appears burned. If the temperature exceeds the typical range for the Maillard reaction, it is common to talk about pyrolysis, which can be characterized as heat-induced decomposition. 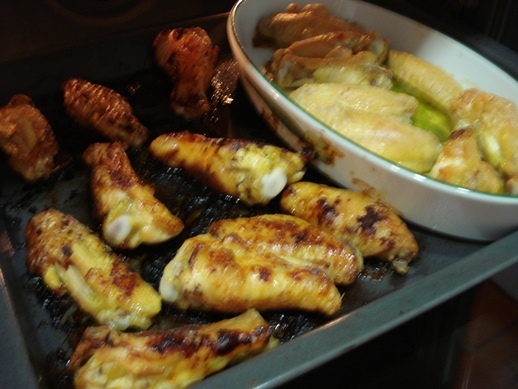 If uncontrolled, pyrolysis of foods will typically give rise to burned and bitter flavors. However, the desirable smoky flavor in barbecue sauces and Scotch whisky comes from the controlled pyrolysis of wood and peat, respectively. Even though the temperature is ideal for the Maillard reaction to proceed on the surface of a steak, for instance, the great challenge is that the interior of the steak should not exceed 122 to 150°F (50–65°C), depending on consumer preference. This leaves a relatively narrow window in which the temperature gradient through the steak is at the desired core temperature and sufficient Maillard products have been formed on the surface. With the sous vide (vacuum) cooking technique, this is solved by bringing the whole piece of meat to the desired core temperature in a temperature-controlled water bath, followed (or preceded) by a quick browning of the surface, either in a sizzling hot pan, on a hot grill, over a gas flame or with a blowtorch. Contrary to popular belief, the Maillard reaction will also occur at lower temperatures. In vintage Champagne, autolyzed (inactive) yeast and sugars react to form Maillard products that yield a characteristic flavor profile. This reaction takes place in the cool chalk cellars of the Champagne district in France, where the temperature remains constant at 48 to 54°F (9–12°C) year round. Because of the low temperature, a much longer reaction time is needed, so the characteristic Maillard-influenced flavor is found only in aged Champagnes. If the temperature is increased, the reaction will proceed more quickly. When liquids such as stock or demi-glace are boiled, plenty Maillard products are formed within hours. Similarly, a roux is cooked not only to remove the flour taste but also to allow the development of flavors. To make dark stocks for brown sauces, the meat and bones are roasted prior to boiling in order to create an even more intense meaty flavor. The presence of water limits the maximum attainable temperature as it boils off from the surface of foods, thereby slowing the Maillard reaction. However, once water has evaporated, for example, in a bread crust or on the surface of a french fry, the drier surface allows the temperature to exceed 212°F (100°C), which in turn drastically speeds up the Maillard reaction. Similarly, a piece of toast browns in the outermost layer only. But less water is not always better. There is an optimum water level required for the Maillard reaction to proceed. If the food gets too dry, the lack of water will actually slow down the Maillard reaction as the mobility of the reagents decreases. 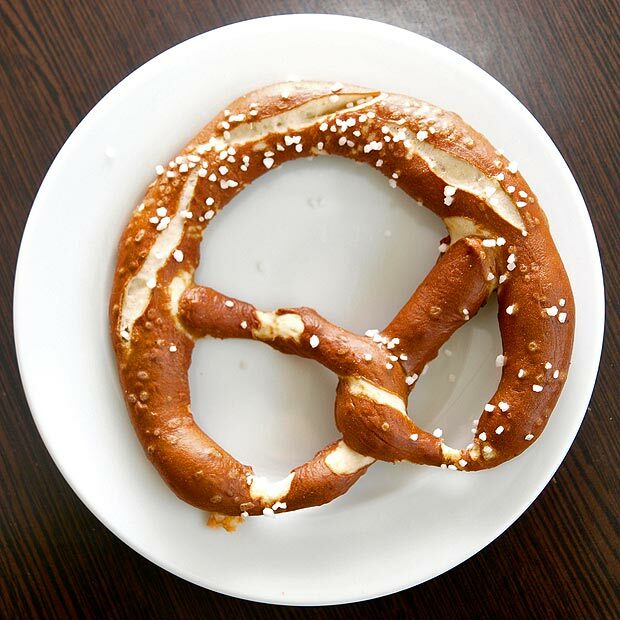 The beautiful browned surface of a traditional Bavarian pretzel is the result of a seredipitous discovery in 1839 when a German baker by accident used lye to glaze his pretzels (Photo: Pretzel from Bigstock). Another way of influencing the Maillard reaction (and perhaps the least obvious) is by adjusting the pH. The Bavarian pretzel is an extreme example of how the Maillard reaction can be tweaked, and it seems it was a serendipitous discovery. On February 11, 1839, the German baker Anton Nepomuk Pfannenbrenner unintentionally used the lye (sodium hydroxide, or caustic soda) intended for the cleaning of his baking sheets instead of sugar water to glaze his pretzels. The customers, who were used to sweeter pretzels, liked the new taste, and to this day, Bavarian pretzels and even the ubiquitous pretzel sticks are sprayed with (or immersed in) a 1 to 3 percent solution of sodium hydroxide before baking. The high pH speeds up a bottleneck in the Maillard reaction and the result is a delicious savory snack with a shiny brown finish. A more common basic ingredient found in most kitchens is baking soda (sodium bicarbonate). Its most common use is as a leavening agent, which requires the addition of an acid to function. Since it is a weak base, it can be used to increase pH and hence the speed of the Maillard reaction. When making pretzels at home, baking soda can easily be substituted for sodium hydroxide. Since baking soda is a weaker base, some recommend using boiling water when immersing the pretzels (as opposed to cold water when using soda lye). When baking soda is used as a leavening agent in cookies, a side effect is more rapid browning and a more pronounced nutty flavor. Dulce de leche is a popular sauce and caramel candy in Latin America. It is made by slowly boiling sweetened milk. Baking soda is not a required ingredient but is often included. The baking soda gives dulce de leche a darker color and contributes to the flavor by facilitating the Maillard reaction. Similarly, it is the baking soda that gives persimmon puddings their dark brown color and rich flavor. The kinds of chemical reactions observed in Champagne, stocks, and caramel candies belong to the less frequently encountered examples of Maillard reactions that occur in the interior of foods. The reason the Maillard reaction primarily occurs on the surface of foods is of course because of the higher heat and lower water content (from evaporation) encountered there. Microwavable pies with browning crusts are challenging to produce because microwaves primarily interact with water and therefore bring the temperature only up to the boiling point. This is the reason microwave cooking in general does not contribute much flavor to dishes and why microwave ovens are used mainly to reheat food. In order to get a nice browning of a pie crust in a microwave, pH adjustment is combined with the addition of reducing sugars and amino acids. Another example of baking soda use on surfaces is in Chinese and Japanese tempura batters. In addition to a leavening effect, the baking soda also gives a more rapid browning. 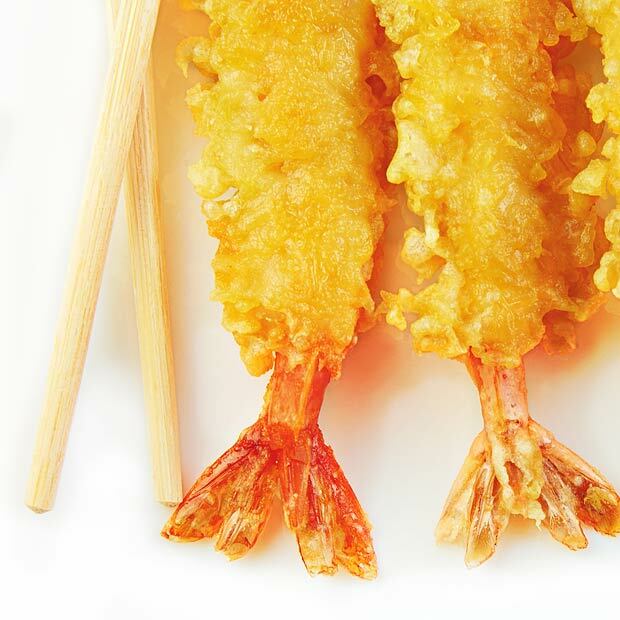 Baking soda can give a tempura batter extra fluff and lightness, as well a slightly higher pH for more rapid browning (Photo: Shrimp Tempura With Chopsticks from Bigstock). At the beginning of this chapter, I mentioned how a pinch of baking soda could influence the browning of onions. The browning proceeds faster and the result is a remarkably sweet flavor with strong caramel notes. 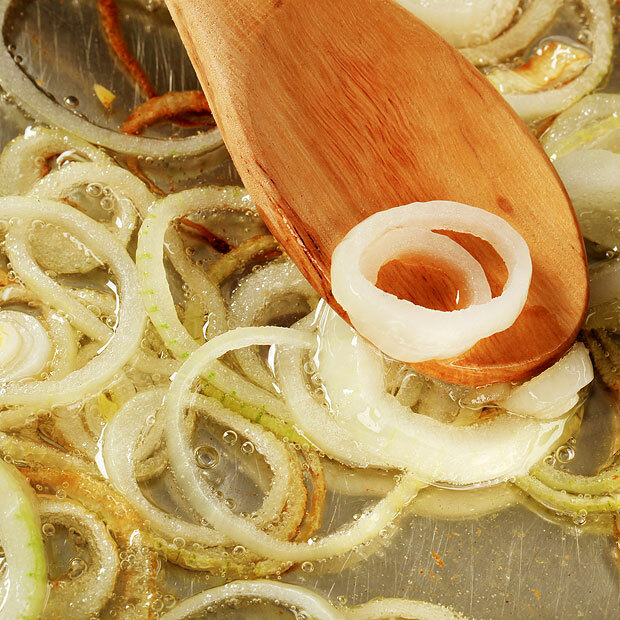 The alkaline baking soda increases (or at least stabilizes) the pH of the onions, which release acidic compounds when chopped and subjected to heat. More water is lost than without the soda, and the chopped onions collapse to a certain degree. If too much baking soda is used, the onions turn mushy and wet. One possible explanation for this is that the alkalinity facilitates onion cell-wall destruction, resulting in the rapid release of the intracellular juices. Interestingly, some recipes recommend adding salt when sautéing onions, and salt facilitates osmosis which draws water out of the cells. The evaporation of this water adds to the overall cooking time which may increase the amount of Maillard products. But more importantly salt will of course also act as a flavor enhancer. 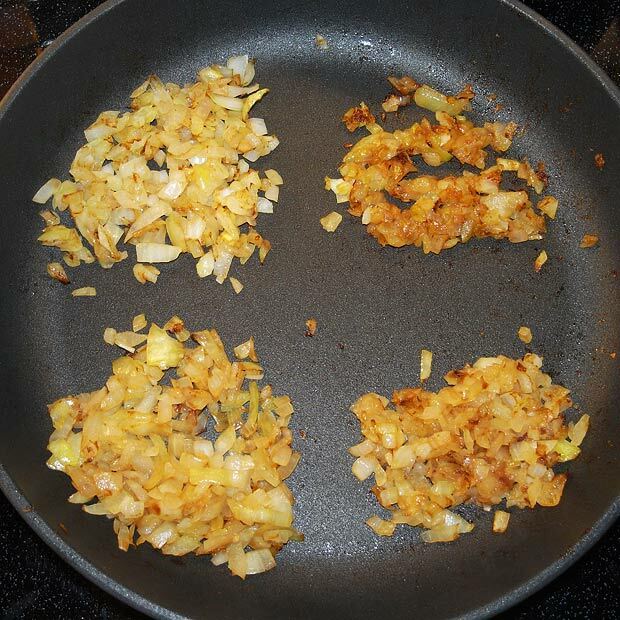 To simultaneously compare the effect of salt and baking soda, I chopped a couple of onions, put them in a hot frying pan with some oil, and split the onions in four equal portions. To three of the portions, a pinch of baking soda, salt, and a baking soda/salt mixture were added, respectively. The last portion served as a control. The experiment revealed a significant difference between the baking soda and salt. With the baking soda, a faster browning was observed, and the onions came out very sweet, with caramel notes. The salt had no significant effect on the browning but did enhance the savory flavor. Also, the onions with salt retained a slight acidity that could not be detected in the baking soda portion. The onions that were browned with the baking soda and salt mixture (1:1) had the best flavor, probably due to the enhanced savory taste from the salt combined with the rich caramel sweetness. Investigating the effect of salt and baking soda when sautéing onions. From top left, clockwise: reference (no salt, no baking soda), baking soda, baking soda and salt, only salt. Apart from the effect on the overall speed of the reaction, changing the cooking conditions also favors other reaction pathways, which in turn result in different flavors. For instance, in a model study, it was found that the formation of 2-furaldehyde (almondy, woody, sweet aroma) was favored at a low pH, whereas furanone (caramel-like aroma) was favored at a higher pH. The latter fits well with the observations from the onion experiment. But because of the complexity of the Maillard reaction in real food systems, there is reason to believe that much remains to be discovered about how pH affects flavor. So far, I have discussed how the Maillard can be made to proceed faster, but sometimes the opposite is desired, especially in industrial-food preparation. In dehydrated products, such as instant potatoes, milk powder, egg powder, corn starch, cereals, and fruit, the Maillard reaction causes deterioration of the food colors and decreases the nutritional value. And ever since the discovery of high levels of acrylamide in fried and baked foods in 2002, a real effort has been made to reduce these levels. In home cooking, a motivation for slowing down the Maillard reaction could be a desire to emphasize the intrinsic flavors of the ingredients used. The conditions that speed up the Maillard reaction can be reversed to achieve the opposite result (table 1). Using a lower temperature and a shorter cooking time is so obvious that one would not even think of it as a way of reducing the amount of browning. When cooking jam, the cooking time is kept short in order to reduce the decomposition of pectins and the formation of unwanted Maillard products. Similarly, removal of milk solids is what allows clarified butter to be heated at higher temperatures than normal butter. When making ghee (India’s clarified butter), however, these milk solids are allowed to react for some time before they are removed, giving ghee its characteristic nutty flavor. The addition of water can help to lower the temperature and halt the Maillard reaction, which is what happens when a pan is deglazed with water, stock, or wine. The water stops the reactions and helps collect the flavor molecules. Excessive browning in cookies can be avoided by the addition of an acid that lowers the pH. To conclude, it is fascinating to consider how well the Maillard reaction–in many cases, without knowledge of the basic science behind it–has been manipulated by home cooks everywhere. By adjusting simple parameters, such as sugar, water and protein content, temperature, and pH, the Maillard reaction can be made to proceed faster or slower and therefore influence the reaction pathway and the relative concentrations of the resulting flavor compounds. In an educational setting, this can be used to illustrate basic chemical reactions. For home cooks, it demonstrates that they may know more chemistry than they are aware of. And for the scientist, it may serve as inspiration for further study of the Maillard reaction in gastronomy. But, most important, in the everyday kitchen, this knowledge can be used by the creative cook to improve old dishes and invent new ones. Nursten, Harry. “The Maillard Reaction: Chemistry, Biochemistry, and Implications”. Cambridge: Royal Society of Chemistry, 2005. A word of warning: most foods are acidic, and this provides a natural protection against the growth of microorganisms in general and Clostridium botulinum in particular, the latter producing botulinum toxin (which gives rise to botulism, a paralytic and fatal illness) in foods that are stored in the absence of air and have a pH greater than 4.8. The addition of alkaline reagents, such as baking soda or soda lye, will reduce the acidity and hence diminish the natural protection against microorganisms. Because of this, care should be taken and baking soda should not be used in marinades, for instance, that will remain in contact with meat for more than a couple of hours. The use of alkaline reagents for foods that are cooked immediately, however, is unproblematic. Copyright © Columbia University Press. This text was first published as a chapter in “The kitchen as laboratory – Reflections on the science of food and cooking” edited by César Vega, Job Ubbink and Erik van der Linden. Does this mean one could brush or sprinkle the surface of meat, fish or other ingredients with baking soda (or a solution of baking soda and water) before pan frying to get a quicker browning? Hi, Thanks SO much for the eye-popping post. Impressive. Re. torrefacto coffee: Spanish torrefacto is terribly bitter due to the burning of the sugars while roasting (it goes well beyond Maillard as coffee beans are toasted at very high temp)- it’s an acquired taste that, at least for me, its totally unpleasing. I’m sure a non Spaniard would not like it. Re. Baking soda: it is also used in Asian cooking to tenderize meat (also egg whites) that, if used excessively, can bring a mushy texture to beef, pork and chicken. And of course, also speeds up Maillard when stir fried. Umami Madrid: Thank you for an insightful comment with many interesting observations! Regarding the Wagyu browning: did I understand it correctly that they first cook it sous vide with cream (which may give an initial browning, even at the low temperature) and then finish it off with a browning at higher temperature? BTW, this reminds me of an idea presented recently by @benreade where he utilized the enzymes in diastatic malt for sous vide cooked pork: http://www.nordicfoodlab.com/2012/03/hello-sweetness/ The resulting pork was described as “tender, sweeter and more enjoyable than that without malt”. Interestingly there was no mention of a subsequent browning, but the stage should certainly be set for a very nice browning reaction if extra sugars have been liberated with diastatic malt. Thanks for the excellent summary. Another example for low-temperature, high-pH, long cooking is the cooking of eggs in the traditional Jewish weekend dish, Hamin (Tscholent) (these eggs are called in Spanish\Ladino Haminados). The dish, containing a whole meal, e.g. meat and beans, often contains also whole eggs in their shell, and is cooked at a low temperature of around 70oC for the whole night. The eggs turn brown and have a nutty taste, due to the Maillard reactions in the basic environment of eggs. 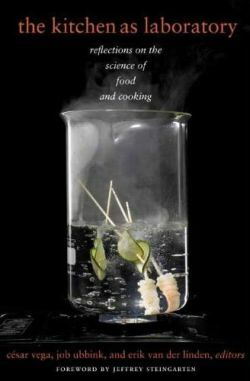 I was happy to find reference to this in Herve This’s book “Molecular Gastronomy”. Umami-Madrid, thanks for mentioning the use of milk powder as an enhancer of the Maillard reactions. I was asked why bread machine recipes often ask for milk powder and am contemplating on this for quite some time. This sounds like a possible direction! Naomi: Thanks for bringing Hamin/Cholent to my attention! These eggs remind me of the Korean Maekbanseok gyeran. You make a good point about the basicity of the egg whites. Because the pH of egg whites changes as carbon dioxide diffuses out of the eggs (fresh egg white 7.9, aged egg white 9.3) it should be possible to spot different shades of brown color, depending on the age of the eggs. Has anyone observed this? Martin, that’s a nice idea for an experiment, comparing eggs of different age in one pot. I wonder whether after so many hours of cooking there would be a noticeable difference, but it is an easy thing to check. I’ll try it next winter (or before, if I can’t wait…) and let you know! And apropos, here is another long-cooking dish that results with brown, tasty dough – the Yemenite Jewish Jachnun, also cooked all night on low heat: http://en.wikipedia.org/wiki/Jachnun. I guess that here it is the butter that starts the browning reactions. Umami-Madrid – thanks for the milk powder link! It seems very helpful. Great Article. I wish I knew half of what you have forgotten. I make waffles 3-4 times a week and have a “Master Mix” of dry ingredients to which I add water and eggs to make a single waffle when desired. (Breakfast, lunch, dinner, snacks, for sandwiches, etc). As I have changed my mix to maximize taste and texture, I have noticed the color/texture/taste of the final product change subtly and even concluded it had more to do with the ingredients than even the cooking time. I see now it has been the result of the carmelization and Maillard processes? I will pay more attention to the sugar/dry milk/baking soda constituents. I’d like a nice “crunch” while keeping a bit more moisture than I do–until now I thought those were opposing forces–and they still might be–but we will play with it. I am going to make a poster (for myself) of your picture of the onions in the pan. It speaks to me of life, its meaning, the need for experimentation/observation/reproducibility/challenging the unknown. All in a pan of onions. What could be more sublime? Another example of high pH cooking is “lutefisk”, where fish is marinated in a lye-solution before being cooked in a pot or in the oven. However, lutefisk is usually quite pale, why does it not brown when cooked? Henrik: I would guess because the pH is not so high during the actual cooking and the concentration of reducing sugars (if at all present) would be very low. Wow, I haven’t studied chemistry since my freshman year at college (1989) and here I am enthralled with your wonderful and simple illustrations of the Maillard process in cooking. I enjoy cooking and the science behind it. Besides the cited works are there other books you would suggest? Thank you, it was a pleasure to read the first, second and third times. I couldn’t help it, so well written, so easy to follow! As well with the onoins added a touch of star anise while browning for a meat dish. This can be done without the baking soda and will also speed up Maillard Reactions and help to boost UMAMi flavors in meat and meat dishes using this technique. This is actually an ancient midevil technique known for centuries and being applied more and more today thanks to the avnat garde movement. There are certain enzymes in star anise that allow this to happend and speed up maillard reactions much as the baking soda does but can do what the soda doesn’t so well, really boost UMAMI flavors, Heston Blumenthal adds Star Anise to every meat dish he uses onions with and at times to increase the browning and sweetness of the onins themselves. thanks for a great posts about maillard reaction.. 🙂 great help for my research. In light of your thought provoking blog and great comments left for this particular entry on the Maillard reaction, I thought readers would enjoy the following reference values for the pH of various foods and ingredients. My mom taught me that a pinch of baking soda also makes green vegetables greener. Too much also makes it mushy. I’ve been using the Hydro colloid collection pdf in a Principles of Cooking course I teach. The students reference it for food experiment ideas, that they must present in class. I’ve recently started digging deeper into khymos.org, and have to say, this sight is an amazingly wonderful place for the curious cooks of the world! I love it! Looking forward to new posts with the same anticipation I remember having as a child waiting for my x-ray specs to arrive in the mail, though I’m sure new posts won’t disappoint. Hi Martin, here’s an interim update on the browned eggs: as I saw I do not get to preparing Tscholent myself this year (had it as a guest, though), I cooked the eggs alone. This is commonly done when there is no room in the main pot for the eggs. They are covered with water and cooked in the same oven with the stew; often peels of onion, a tea bag or soy sauce are added too, however, in my opinion, these pigments only color the shell and do not penetrate the egg. A proof: the egg-white of the occasional cracked egg has a thin, outer dark brown layer, while the rest of the egg is uniformly cream-colored, just like the other intact eggs. Anyway, I cooked six eggs, two each of three ages: a month, two weeks and fresh, for 8 hours, at 90oC, covered with water, with peels of onions, added for the sake of tradition. The shells were indeed brown, but the eggs themselves were all the same color, which was white. So no browning occurred. I find this puzzling. Will check this further. But, of-course, browning won’t occur in water, so will cook them again dry. So, cooked eggs of three ages (1, 2, 3 weeks) overnight, at 90 oC, dry (no water) and they all browned. There was no significant difference between the color of the eggs. I guess that for that a much older egg should be compared to a fresh one.